Can Biochar make Olives fruit more? Biochar project will find out. Olives are a ancient and useful tree. They can live over 1000 years and they have many different offerings for our culinary palate. From Olives oil to Olives leaf extract this amazing tree really likes to provide for mankind. 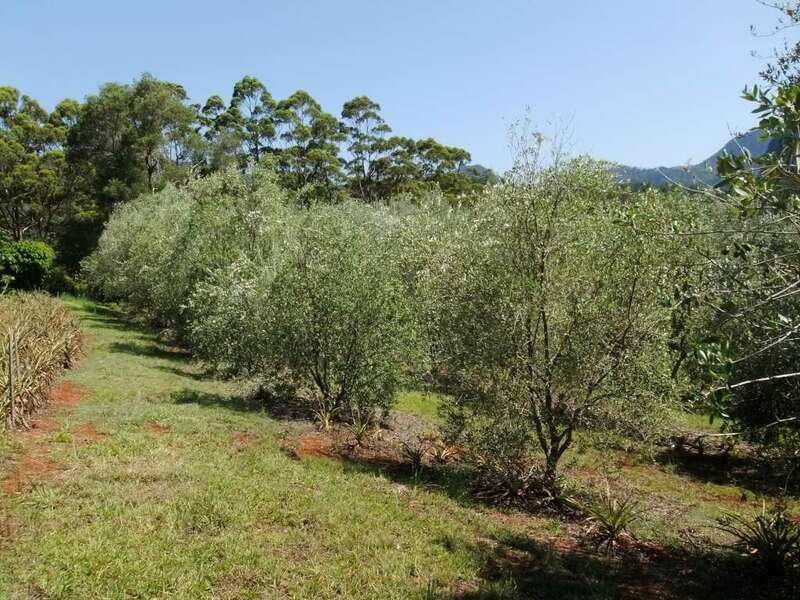 However trying to grow olives in the northern rivers is a real art as mostly the trees do not produce nearly enough to make it viable for farmers to pursue. So to put my money where my mouth was I agreed to do a Biocharproject on his farm as part of finding out more of what biochar can do. We arrived on Thursday afternoon with a bulky bag full of char. It was not long before we started dividing it out between the compost tea barrels the farmer had waiting for us. Some of the research I had done on this olive fruiting problem led me into several directions. Very soon after doing soil and compost tea P.H tests we realized that the soil may have been a little bit too acidic for the grand olive trees. So we set about adjusting the PH of the Brew with Agricultural Lime. We allowed the brews to sit overnight so the char could soak up some of the goodness. The next day we devised a plan and started to write up our proposed test trial. We had some fabulos conversations and a tour over this amazing chemical free farm. Talk about self sufficent this place had heaps of food trees. 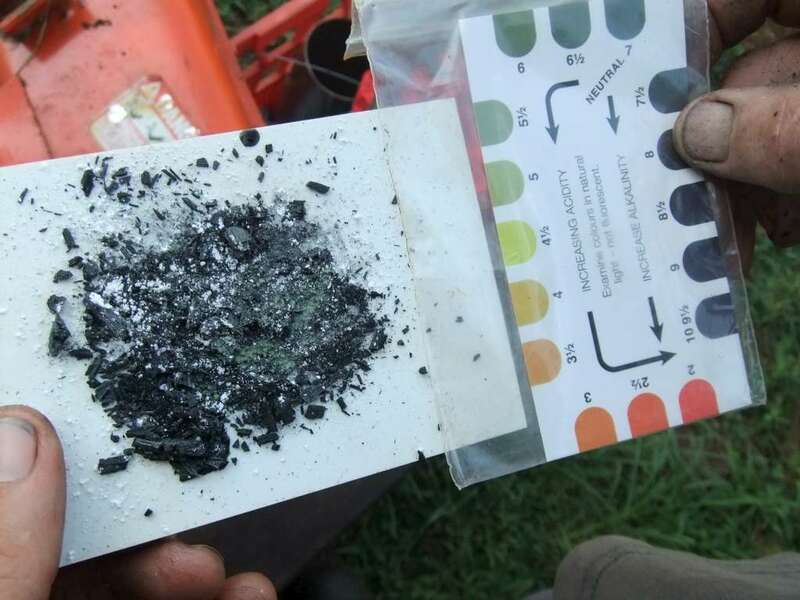 I was really glad I got the oppurtunity to introduce the farmer to Biochar in this way. The farmer had been using biological and biodynamic concepts to keep his trees healthy and strong. On closer inspection I observed that he did not have many of the problems other tree growers of this area had. I asked him about it and he swears that the compost tea is the reason everything is so healthy. So with all this background information I feel that the biochar we applied is really going to make things happen on his olive trees. What we did was take 2 rows of olive trees at the very top of the plot. There was around 25 trees in all. The first 5 trees in the row I put approximately 12 tons per hectare biochar soaked in compost tea and lime. Around the trunk under the canopy about 1 meter out as this is where the feeder roots are. Then I put out 8 hand fulls of craker dust (Dust from breaking up rock) over the moist char then I mulched it over. And the last 3 trees on the row I decided to throw out a curly one. I placed 10 tonnes per hectare dry biochar then mulched it. This I thought would make a good contrast to the other tests. Then we did the exact same again on the next row down. The trees were on a slope so I concentrated most of the char biological mix to the upper side of the trees. We are exactly about one month off the flowering and fruiting season so it would be interesting to find out if any improvement at all in the short term is fourth coming. I have converted another farmer onto the wonders of biochar and have gained a new friend in the process. Special thanks to Biochar Industries for the help with the Olives. 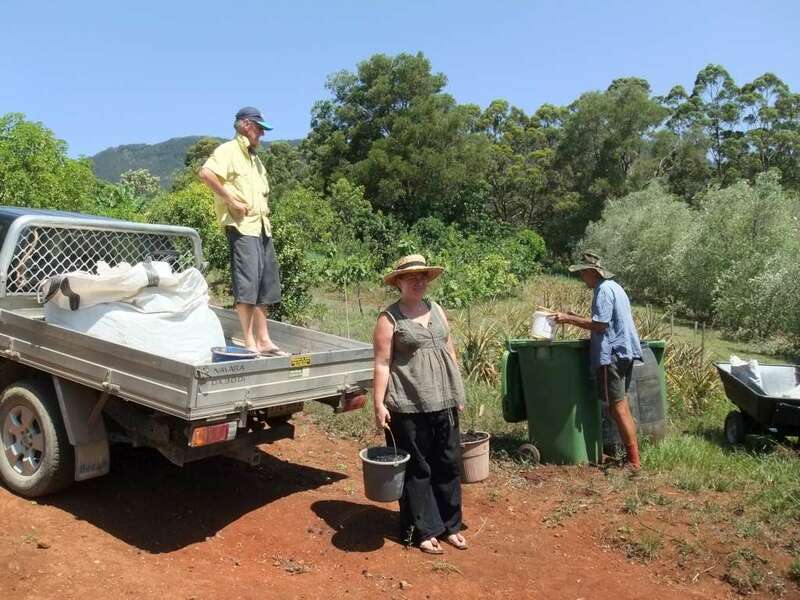 If you live local to northern NSW Biochar Industries has a big Biochar Bash this coming weekend click here to read more. Stay tuned to this post for an update. 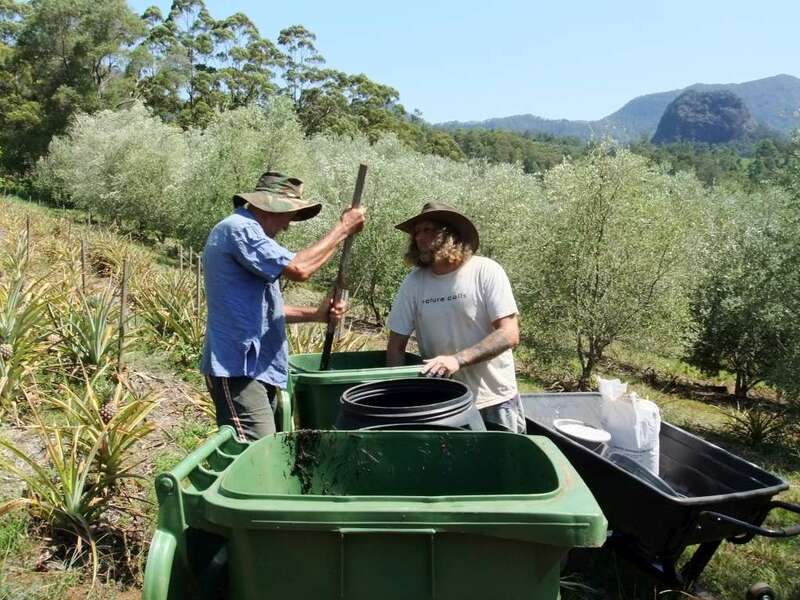 Can biochar make bigger fatter and more Olives ? 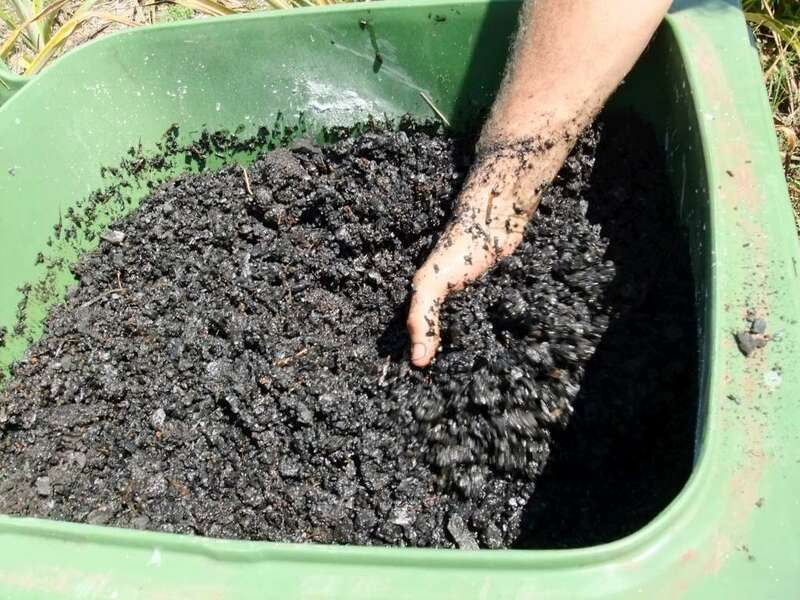 You betcha Biochar can do it. One can go very far in this world by quoting the letters of Geoff Moxham. You may find some collaborators interested in this, to my knowledge, pioneering work with olive trees. The studies below concern using olive pits, huska and mill waste for char & Bio-oil Manufacturing with the Perth Olive mills. Maybe you could even find funding. .
On a wide tangent, and in tropical soils, the only work I have seen similar is with cacao trees, Craig Sams achieved fruiting in three-year-old trees while his non-Biochar control trees normally fruit at five years. The olive tree, Olea europaea, has been cultivated for olive oil, fine wood, olive leaf, and the olive fruit. The earliest evidence for the domestication of olives comes from the Chalcolithic Period archaeological site of Teleilat Ghassul in what is today modern Jordan. Farmers in ancient times believed that olive trees would not grow well if planted more than a certain distance from the sea; Theophrastus gives 300 stadia (55.6 km/34.5 mi) as the limit. Modern experience does not always confirm this, and, though showing a preference for the coast, they have long been grown further inland in some areas with suitable climates, particularly in the southwestern Mediterranean (Iberia, northwest Africa) where winters are mild. Olives are now cultivated in many regions of the world with Mediterranean climates, such as South Africa, Chile, Peru, Australia, and California and in areas with temperate climates such as New Zealand, under irrigation in the Cuyo region in Argentina which has a desert climate. They are also grown in the Córdoba Province, Argentina, which has a temperate climate with rainy summers and dry winters (Cwa). The climate in Argentina changes the external characteristics of the plant but the fruit keeps its original features. The northernmost olive grove is placed in Anglesey, an island off the north west coast of Wales, in the United Kingdom: but it is too early to say if the growing will be successful, having been planted just five years ago. Olives are now being looked at for use as a renewable energy source, using waste produced from the olive plants as an energy source that produces 2.5 times the energy generated by burning the same amount of wood. The same reference claims that the smoke released has no negative impact on neighbors or the environment, and the ash left in the stove can be used for fertilizing gardens and plants. The process has been patented in the Middle East and the US (for example). Will send you an update 🙂 Things take a long time to quantify but I am sure we have some positives for you already. We are thinking about doing a similar experiment with a plot of olive trees on our farm in Tuscany, Italy. I see it has been several years since you applied the biochar. Just wondering if you have any preliminary results you’re able to share?